Description Winter Steelhead and trout fishing requires numerous layers to be comfortable. 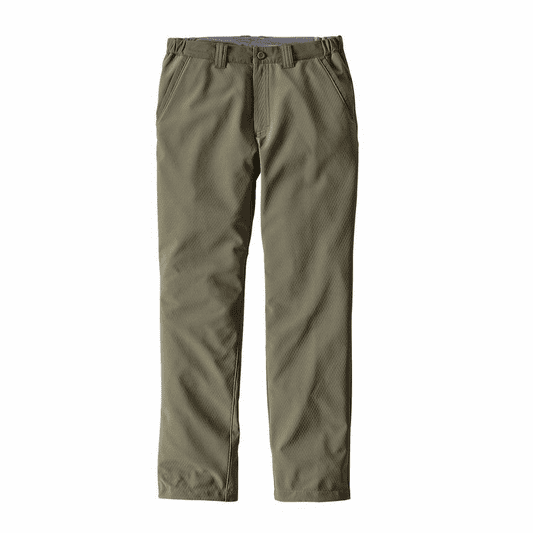 The Shelled Insulator Pant from Patagonia is that finish exterior layer that seals out the wind. They are also water resistant and DWR coated, in addition they have a grid fleece back interior for warmth. When you roll into the convenience store or camp at either end of the fishing day these pants look way better than your "wader tights" you have been sporting. Two front pockets, on zippered hip pocket, belt loops, zippered fly. A velcro adjustment allows for a tight fit at the ankles. These are a killer cold weather fishing pant. The fit has been improved and they are way less bulky than the original design.